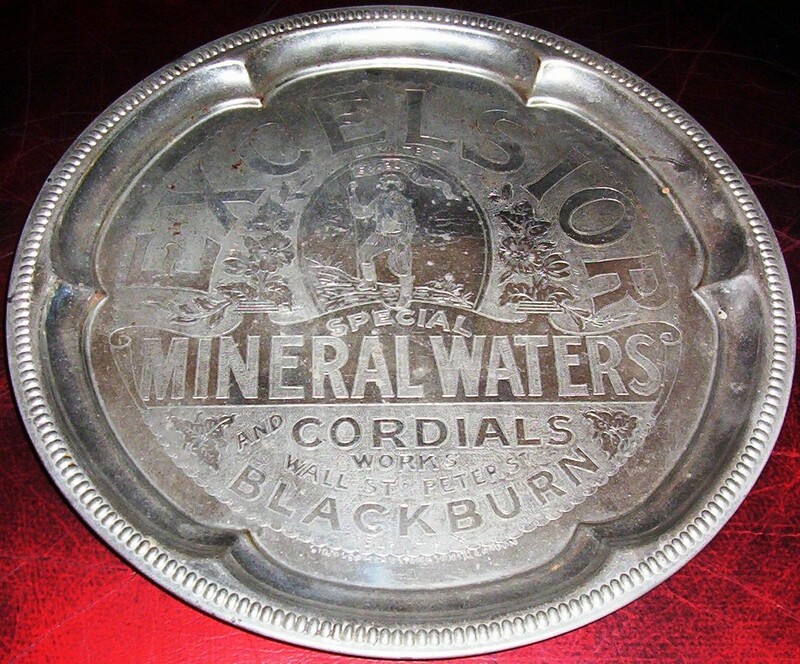 With having an interest in Blackburn's history, about 20 years ago I started collecting all kinds of artefacts from our town's past. This consisted of all kinds of items, my only criteria was that it needed to either have the word ''Blackburn'' on it somewhere or be easily identifiable with the town, ie have a name like Thwaites , Dutton's , Lion Brewery or a company like Northrop , Mullards , Foster Yate & Thom , names that were synonymous with Blackburn. I soon started amassing quite a collection of old Victorian and Edwardian bottles, mainly glass initially (about 160+ different ones), but then found the less common stoneware ones more attractive. 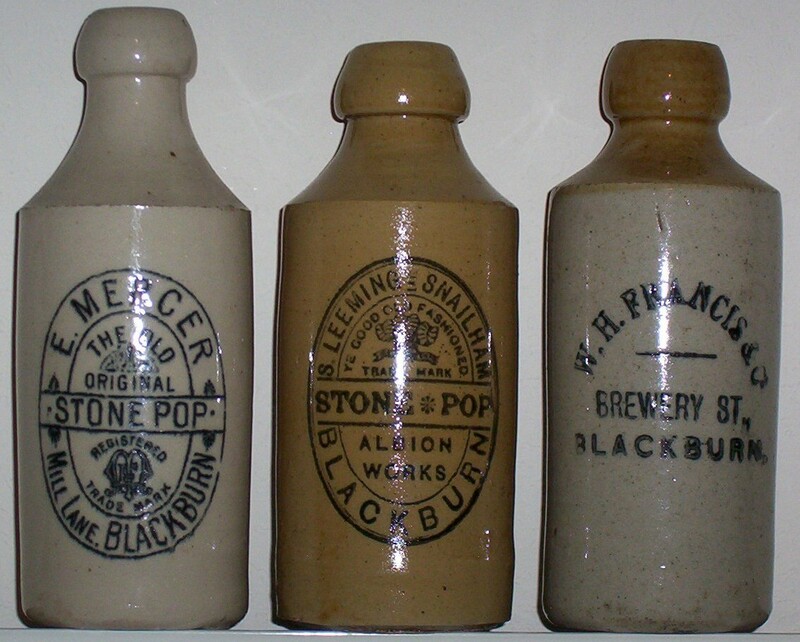 The majority of these would have contained Ginger Beer or Stone Pop in their day (root extracts, such as dandelion, burdock, sarsaparilla) and hop beers, or like the four in the bottom photo, porter, which was a dark, alcoholic beer. 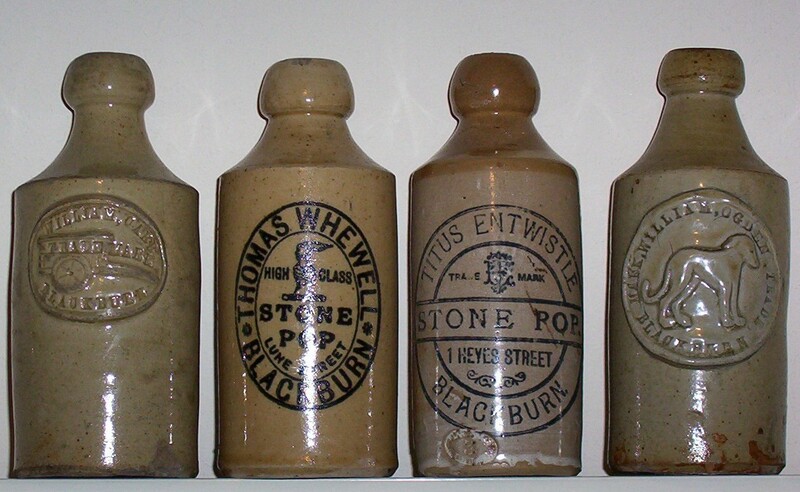 Some of the names on the bottles were large outfits, like Meadowcroft & Law , Thwaites , Nuttall's and Monk's, but some are from far smaller concerns like Titus Entwistle and W. H. Francis. Many are names long forgotten in our town's history, but 100 or 150 years ago (a few of the above bottles date to the 1860's / 1870's) they would have been thriving business's. After 15 - 20 years of buying the stoneware, I'm still adding to the collection, so if you happen to have one sitting in your attic or cellar, stored away in a box in your garage or a crate in your shed, I could be interested ! Below is a nice old photo to go with this post. The pony & trap on the right of the picture would have belonged to one of Blackburn's largest manufacturers of mineral waters. 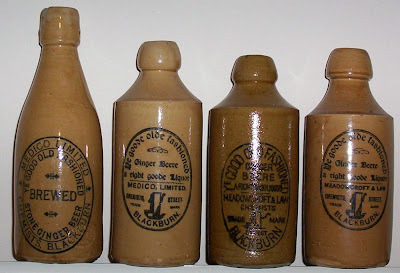 They started out as W. Meadowcroft & Son and ended up as Meadowcroft & Law, but somewhere along the line, they traded as Medico too( please see the row of bottles above the porters). 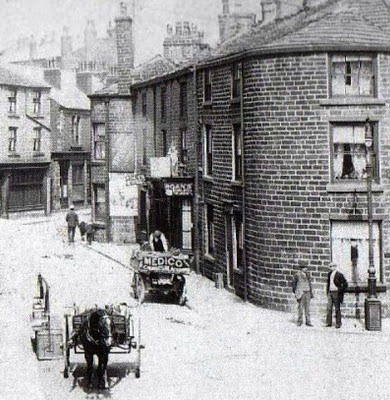 This photo was taken outside the Angel Inn in Darwen town centre. Are the pictures above from your collection? The tray is my own too, it came up on ebay a few years ago. Cost me a bloody fortune, but I've never seen another. 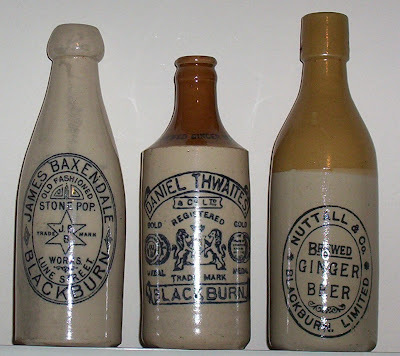 Iam looking for DARWEN bottles - in particular John Haydock Ellenshaw works or Foundry Street. Can you help or advise further? 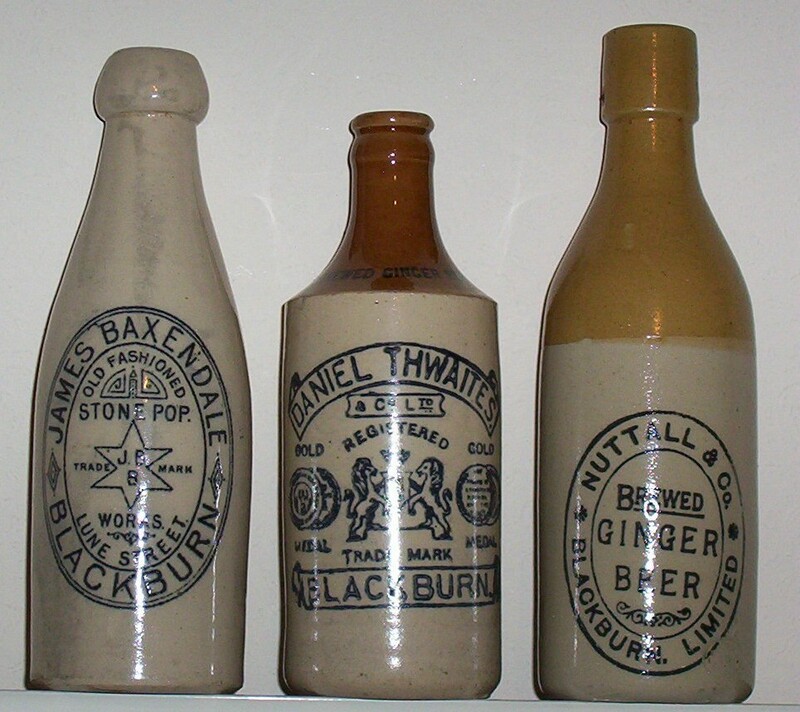 I have come across the Haydock's bottles over the years, usually the glass ones. Only advice I could give you is keep looking and don't give up, as they're definitely out there. Keep looking on ebay and try local car-boot and antique fairs. My husband is the direct descendent of William Hodgeson (great great grandfather). Would you be willing to sell one bottle to us? His daughter Martha Emily married George Alfred Hunt. I really love your collection, & what you’re doing. I am writing on behalf of my husband (native of Blackburn). He’s a direct descendant of William Hodgson (great great grandfather), who owned a brewery. His daughter Martha Emily Hodgson married George Alfred Hunt. 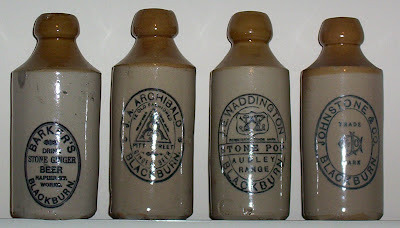 Would you be able to sell us one of your bottles that are on the pictures. We would like to have it as part of his family history. At present I only have two Hodgson stone bottles, the transferred one in the centre of my photograph up above and a more plain impressed one (similar to the bottles in my bottom photo) and I don't really want to part with either at the moment. 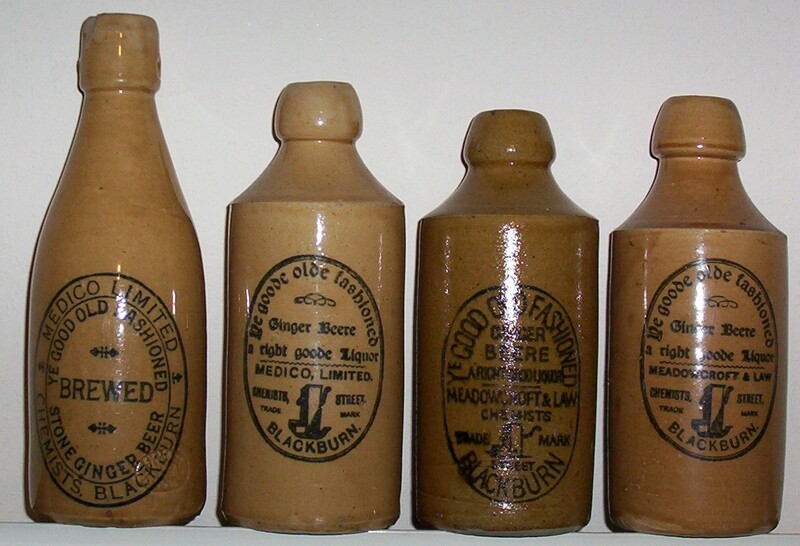 But I do have a couple of Hodgson glass bottles from the same period that I could be persuaded to part with. One has the same design embossed on the front as the ginger beer up above, the praying figure of St Paul and the other has a different design, the name embossed towards the top and below it the initials WHB in a clover / entwined circles like design. 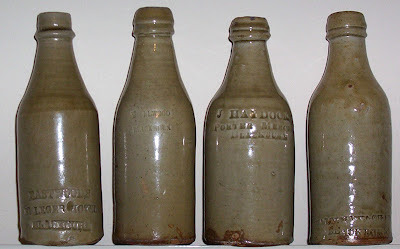 If you send me another message and include an email address in it, I will email you directly and include a couple of pictures of the glass bottles. I wont approve / publish your next message, so your email wont be seen by anyone but myself. PS, Your email address wont be seen by anyone else is what I meant to say.